Slow it down, spread it out, soak it in. 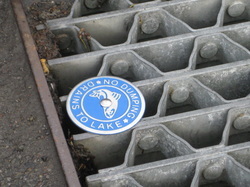 Schuyler County SWCD conducts many stormwater educational programs together with the Chemung County Stormwater Team, the Rural Stormwater Coalition (RSC), the Schuyler County Water Quality Coordinating Committee (WQCC) and Cornell Cooperative Extension. Schuyler County uses the technical expertise of Jessica Verrigni, the Stormwater Management Specialist for Chemung and Schuyler Counties and member of RSC to assist landowners, developers, and contractors with all aspects of stormwater management and the educational experience of Nicole Watts, a member of the RSC and the Chemung Stormwater Team.